When you walk into the grocery store or pharmacy to buy a simple little product it can be often overwhelming with the number of choices. You want the best foot care supplies for your home the lowest price but how do you find that? With the ease and trust of online shopping, more and more people are choosing to have these items shipped directly to their door. Follow this series of our favourite online purchases of personal care products to help you fix your dry cracked heels and care for your feet. One of the things that you have to keep on hand or at close reach at all times is a nail file. They can be used to straighten ragged edges on your nails, smooth out ridge on your nails, smooth down dry hard cuticles and even as a last resort buff some of the dry skin off your heels. You can buy cheap nail files anywhere but what are you really getting. A piece of cardboard with sandpaper on it that will fall apart after one use. Then you will just have to go and buy more. Why not invest in a few better quality files that you won’t have to worry about falling apart. 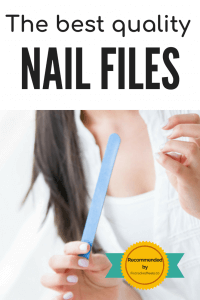 We have found the best quality nail files for the best prices and have included direct shopping links so you can have them shipped right to your door. There are so many foot files on the market of differing size, shapes, and material. It can be difficult to choose which one is best for you. They each work differently, but it’s mostly about preference. Let us help you choose one by reading this handy article. Metal Files are manufactured from stainless steel or nickel which is strong and resistant to rusting. Some metal files come with removable footpads. These often sell for more than other files mentioned. Motorized files are the newest to the market. They used to be used only by pedicurists because they were expensive. At home, styles have become widely available and have a wide variety of options. Make sure you read the manufacturer’s website before purchasing one. Plastic files are the least expensive. Plastic files are one of the most common types available. Grit is glued to the upper part of the file. These are usually quite flimsy and need to be replaced often. They come in many shapes and sizes. Rasps are metal files that have a plastic handle and tiny blades like a cheese grater. 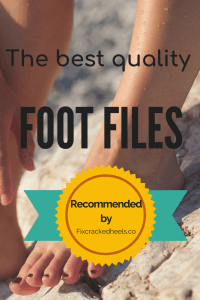 The ultimate guide to foot files for cracked heels Microplanes are the most effective rasp and works the best on cracked heels. You must be very careful with these as they can remove a lot of dead skin at once! Wooden Files are usually built like a small paddle and are much sturdier than plastic files. The grit is sandpaper glued to the file. Make sure the file is hung to dry and doesn’t stay damp or it will get mouldy or rotted. Body creams and rich moisturizers work the best on heels and foot calluses. But if your heels are dry or cracked, you may want to try a cream designed specifically for the heels. Come in a variety of scents. They are an inexpensive way to help fix cracked heels. 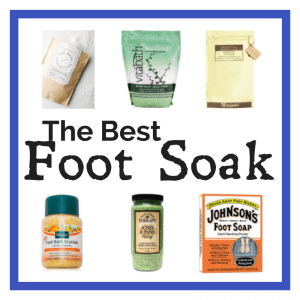 There is a wide variety of foot soaks on the market and we have chosen the most popular selling one to introduce you to. Nail clippers are often inexpensive but are a necessity when it comes to weekly foot care. There are a variety of styles and brands to choose from. We have found that if your not careful you can purchase a cheap pair that will not be strong enough to cut your toenails or rust just from sitting in the bathroom. Take a look a the best quality nail clippers you can get. Have you ever had the chance to soak your feet in a foot bath? If you have, you will agree it is a wonderful and relaxing experience. It can help foot soaks penetrate the dry skin on your feet as well as help the callus slough off easily. It is the perfect start to a DIY pedicure. But how do you choose a good quality one? Leave that up to us! In conclusion, there are a wide variety of products out there. As a result, choosing something that will last long, is easy to keep clean and will make your foot care regime easier.